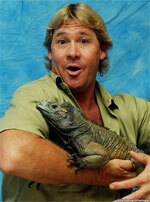 Submit your own tributes on the Steve Irwin Condolences page! Born to Lyn and Bob Irwin in Essendon, a suburb on the outskirts of Victoria's capital Melbourne, Irwin moved with his parents as a child to Queensland in 1970. Bob was a reptile enthusiast and when the family moved, his parents started the small Queensland Reptile and Fauna Park, where Steve grew up around crocodiles and other reptiles. Steve became involved with the park in a number of ways, including taking part in daily animal feedings, as well as care and maintence activities. On his 6th birthday he was given a srub python. Bob educated Steve on reptiles, with Steve getting involved physically with crocodiles at the age of 9. He became a crocodile trapper, removing crocodiles from near populated areas, performing the service for free with the quid pro quo that he kept them for the park. Steve followed in his fathers' footsteps, becoming a volunteer for the Queensland Government's East Coast Crocodile Management program. Steve's father, Bob, described Steve as "a monster" (Discovery: Steve's Story) that was fascinated in animals. Even much so, his father recalled that before their (rare) vacations everyone was ready and packed when steve was out 'chasing and studying' lizards and other animals. The park was a family business, with Lyn and Bob turning it over in 1991 to Steve. He took over the running of the park, now renamed the "Australia Zoo", and in 1992 met (at the park) and married Terri. The footage, shot by John Stainton, of their crocodile-trapping honeymoon became the first episode of The Crocodile Hunter, which became wildly successful in America and the UK. His exuberant and enthusiastic presenting style, broad Australian accent, constant wearing of khakis and catch-phrase "Crikey!" became known worldwide: The Crocodile Hunter aired in over 122 countries worldwide. Under Irwin's expansive leadership, the operations grew to include the zoo, the television series, The Steve Irwin Conservation Foundation, and International Crocodile Rescue. Improvements to his Australia Zoo include the Animal Planet Crocoseum, the rainforest aviary, and Tiger Temple. In 2001, Irwin appeared in a cameo role in the Eddie Murphy film Dr. Dolittle 2. In 2002, his first feature film, The Crocodile Hunter: Collision Course, was released. In general, reviews of this film were negative. In 2003 Irwin was reportedly in line to host a chat show on Australian network television, a series that never eventuated. Animal Planet then released a Crocodile Hunter special called "Crocodiles & Controversy", which attempted to explain both the "Baby Bob Incident" and the Antarctica incident (see below). This special argues that Irwin's son was never in danger of being eaten by the crocodile, and that Irwin could not have endangered animals in Antarctica. Animal Planet ended The Crocodile Hunter with a series finale entitled "Steve's Last Adventure". The last Crocodile Hunter documentary went for three emotional hours with footage of Irwin's across-the-world adventure, visiting locations like the Himalayas, the Yangtze River, Borneo, and the Kruger National Park. Irwin went on to star in other Animal Planet documentaries, including The Croc Files, The Crocodile Hunter Diaries, and New Breed Vets. In January 2006 as part of Australia Week celebrations in the USA, Irwin appeared at the Pauley Pavilion, UCLA Los Angeles, California. During an interview on The Tonight Show with Jay Leno, Irwin announced that Discovery Kids would be developing a show for his daughter, Bindi Sue. The show, Jungle Girl, was tipped to be similar to The Wiggles movies, with songs that surround a story. A feature-length episode of Australian kids TV show The Wiggles entitled "Wiggly Safari" appears dedicated to Steve, and he features in it heavily with his wife and daughter and a pie named "Sweety". The show includes the song "Crocodile Hunter, Big Steve Irwin". Steve Irwin was active in politics and was a supporter of the conservative Liberal Party of Australia. In particular, he strongly supported the incumbent Prime Minister John Howard, describing him once as "the greatest leader Australia has ever had" and the "greatest leader in the entire world"; comments which drew a cynical reaction in the Australian media. As well as being a general ambassador for Australia due to the nature of his work, Irwin was also involved in several media campaigns. He was employed by the Australian Quarantine and Inspection Service to promote Australia's strict quarantine/customs requirements, with advertisements andposters featuring slogans such as, "Quarantine Matters! Don't muck with it" [don't mess around with it]. In 2004 he was appointed ambassador for The Ghan, an Adelaide to Darwin train that began operations in 2004. He was also a keen promoter for Australian tourism and in general and Queensland tourism in particular. In 2002 the Australia Zoo was voted Queensland's top tourist attraction. In 2004 he was nominated for Australian of the Year, which was won by Steve Waugh. Irwin believed in promoting environmentalism by sharing his excitement about the natural world rather than preaching to people. He was concerned with conservation of endangered animals and land clearing leading to loss of habitat. He urged people to take part in considerate tourism and not support illegal poaching through the purchase of items such as turtle shells. He considered conservation to be the most important part of his work: "I consider myself a wild-life warrior. My mission is to save the world's endangered species." He founded the Steve Irwin Conservation Foundation, which was later renamed Wildlife Warriors Worldwide, and became an independent charity. He and his wife remained patrons and major supporters along with the AFL clubs of Australia. Steve Irwin was married to Terri Irwin (1992) and had two children: a daughter, Bindi Sue Irwin (born 24 July 1998), and a son, Robert Clarence "Bob" Irwin (born 1 December 2003). Bindi Sue is jointly named after two of Steve's animals: Bindi, a salt water crocodile, and Sui, Steve's dog, who died in June 2004. Irwin was as enthusiastic about his family as he was about his work. He once described his daughter Bindi as "the reason he was put on the Earth". His wife Terri once said, "The only thing that could ever keep him away from the animals he loves are the people he loves even more." Steve Irwin was a great fan of the Singapore Zoo, which he considered a sister institution of the Australia Zoo. Steve Irwin loved mixed martial arts competitions and trained with Greg Jackson in the fighting/grappling system of Gaidojutsu. Steve Irwin appeared in a 2006 ESPN television commercial in their This is SportsCenter series. In the commercial, he wrestled the Gator mascot of the University of Florida to the ground in an ESPN studio hallway. A parody of Steve and Terri forms one of the themes of Irregular Webcomic! A parody of Steve, Strewth Irwin, is a recurring character on the Flash cartoon On The Moon. He appeared in Dr. Dolittle 2 as The Crocodile Hunter who tried to wrestle an alligator and lost his arm. In 2004, during an interview with Larry King, he admitted that after receiving many painful bites he had a fear of parrots. Steve Irwin was a fan of the Essendon Bombers in the Australian Football League, Essendon being where he grew up as a boy. Steve made several appearances with players and was part of an Australian rules football promotion in Los Angeles as part of Australia week in early 2006.